Home > Fire Safety & EMS > Fire Safety Evacuation Supplies & Tools > Fire Extinguisher Cabinets & Covers > In Case of Fire Break Glass Label - Vinyl Self-Adhesive - 6" x 2"
Home > Fire Safety & EMS > Fire Extinguisher Cabinets & Covers > In Case of Fire Break Glass Label - Vinyl Self-Adhesive - 6" x 2"
Home > Fire Extinguisher Cabinets & Covers > In Case of Fire Break Glass Label - Vinyl Self-Adhesive - 6" x 2"
Home > Fire Safety & EMS > Fire Safety Evacuation Supplies & Tools > Fire Extinguisher Arrow Signs > In Case of Fire Break Glass Label - Vinyl Self-Adhesive - 6" x 2"
Home > Fire Safety & EMS > Fire Extinguisher Arrow Signs > In Case of Fire Break Glass Label - Vinyl Self-Adhesive - 6" x 2"
Home > Fire Extinguisher Arrow Signs > In Case of Fire Break Glass Label - Vinyl Self-Adhesive - 6" x 2"
In Case of Fire Break Glass Label - Vinyl Self-Adhesive - 6" x 2"
These durable and fade resistant Fire Extinguisher Break Glass labels are silk screen printed with UV inks on adhesive vinyl. These red stickers with white lettering provide clear instructions when immediate action is needed to prevent property loss or personal injury. Label Reads: "Fire Extinguisher - In Case Of Fire Break Glass", and includes a pictogram of a fire extinguisher. Mount on a clean, dry, smooth and non-porous surface. For small quantity orders (75 or less) select USPS Priority Mail for best shipping rate. 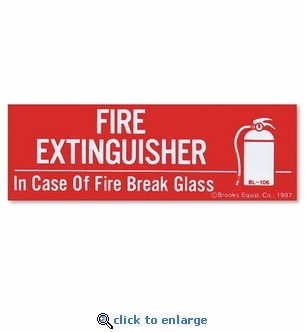 Reversed Type - In Case of Fire Break Glass Label - Vinyl Self-Adhesive - 4.75" x 1.5"
Fire Extinguisher Inside - Vinyl Self-Adhesive Sticker- 4" x 4"
Fire Extinguisher Inside Signs- Vinyl Self-Adhesive - 6" x 9"
Fire Extinguisher Inside Sticker Labels - Vinyl Self-Adhesive - 4" x 3"
Fire Extinguisher Inside Label - Vinyl Self-Adhesive - 18" x 2"
Vinyl Self-Adhesive Fire Extinguisher Arrow Sign - 4" x 12"